Home » Game Management » Effective Game Management: Win More Points, Win More Games! 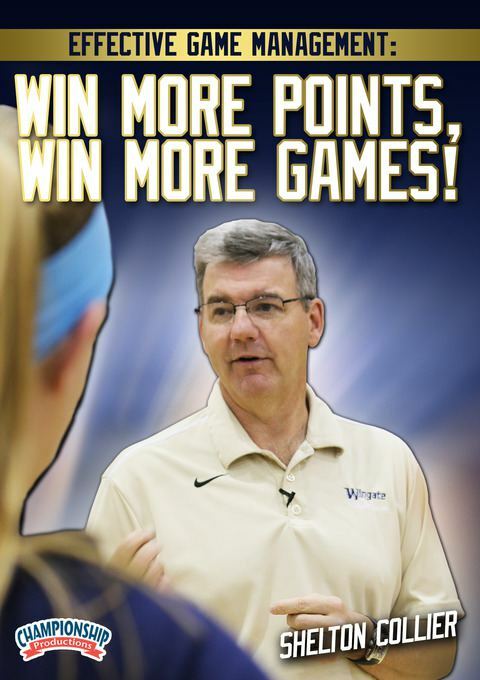 Effective Game Management: Win More Points, Win More Games! Put yourself in position to win more matches by rehearsing and managing game day situations in practice. Coaches spend numerous hours trying to find “magic” drills that will give their players a winning advantage, but they spend little time studying and understanding what it takes to manage a game effectively. Put your team in position to win more games by effectively preparing for and managing your matches. Coach Shelton Collier offers practical and easy-to-follow advice that he’s learned and developed over the course of 900 career wins. In this PowerPoint presentation, you’ll learn how to manage game day situations by rehearsing them in practice so when they occur in a match, your players will be prepared and confident. Coach Collier covers many aspects of what it takes to run great practices and make successful in-game decisions. To successfully make adjustments during a match, its imperative to rehearse them in practice. Coach Collier shares insights into practicing game adjustments such as: shifting passing formations, serving to different zones, stopping a priority hitter, attacking over a small setter, attacking various defenses and the use of substitutions. Once you rehearse these adjustments in practice, your team will be better prepared to make them during a match. To keep the your opponent from overhearing your strategies, Collier discusses how to discreetly communicate with a player on the court. The ability to make a call or an adjustment without your opponent hearing you could be the difference between winning or losing the next point. Coach Collier shares strategies you can use to give your team an advantage before the match even begins. He talks about how to communicate with your team before and during a match, strategies for preparing players for game situations, and the dos and don’ts of pregame communication, pep talks, talking with players and warm-up strategies. Collier also goes in-depth on the variables involved in setting a starting rotation. Effective match preparation will put your players in position to be successful in the match. Discover match strategies you can use to succeed in the heat of battle. Time outs – Learn the when, why and what of time outs. Calling a time out at the right time can have a huge impact on getting your team back on track. Bench stats – Learn what stats can tell you during and after the match and how to use them to help your team win. Serving strategies – Learn how to maximize your team’s point scoring percentage by making good decisions and getting the most value from every server. Volleyball’s version of the full court press – Discover a philosophy you can use when your team is down in a match to a good opponent. Included is a list of quotes to avoid to prevent players from getting discouraged and many more concepts for succeeding in your matches. The concepts and ideas in this video will open your eyes to things that you may not have considered or didn’t fully understand. Implementing these concepts and strategies will give you valuable techniques to help your team win more games.